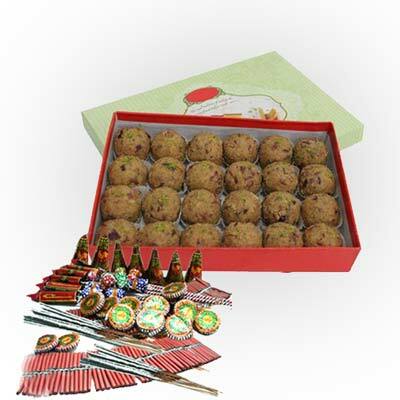 Product Consist : Box of Besan Ladoo (Weight :1 kg ) + Assorted Fire crackers (Worth Rs.300/-) (Note: Types of Fire Cracker are depends upon their availability no specific choice). 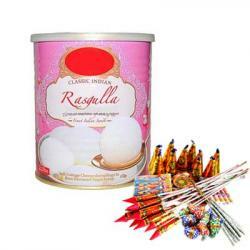 This hamper is one of the awesome gifting options to make your Diwali celebrations exciting. 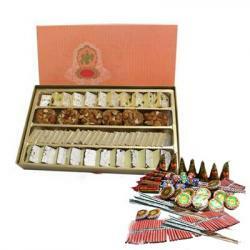 Treat your loved ones to this majestic gift hamper that comprises of a 1 kg box of lip smacking Besan Ladoo and exciting assorted fire crackers worth Rs. 300 that includes amazing sparklers ground chakkars small crackers and so on. 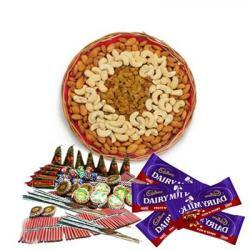 This gift combo is bound to bring smiles on faces of your dear ones. So have fun with your dear ones and make it an exciting and grand celebration by sending them such awesome gift hampers. 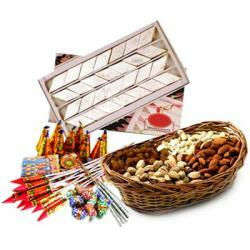 Product Includes : Box of Besan Ladoo (Weight :1 kg ) + Assorted Fire crackers (Worth Rs.300/-) (Note: Types of Fire Cracker are depends upon their availability no specific choice).